The main attraction in this recipe is a dressing made out of dehn jahng (the Korean version of miso), a touch of fermented hot chili paste, and sesame oil. Koreans call this dressing sahm jahng and revere it for its flavour and health-enhancing properties. Sahm jahng is a good source of vitamin K2, vitamin C, and easily digested protein. It is also abundant in health-enhancing bacteria to support gut and immune system health. 1. Mix dehn jahng, sesame oil, and fermented hot chili paste in a small bowl until uniform. If you prefer a thinner dressing, add a teaspoon of water at a time until the consistency suits you. Sahm jahng is typically served in its own bowl at the center of the table, alongside a large bunch of fresh lettuce leaves and plenty of steamed rice for each person. 2. 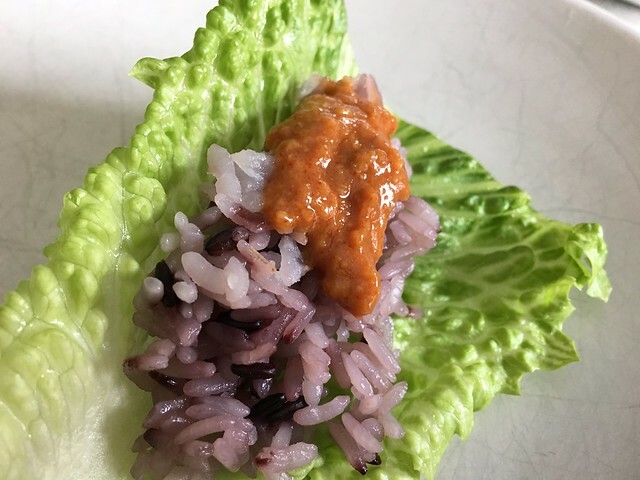 Place a small spoonful of rice in the center of a leaf of lettuce, add a small dollop of sahm jang to the rice, wrap closed with the outer portions of the lettuce, and enjoy! Notes: For two people, you will want a head of romaine lettuce leaves available for wrapping. Sahm jahng makes for a delicious vegetable dip, so it's always nice to have a plate of cucumbers, carrots, peppers, and celery on the side. Hi, what kind of rice is this? It does't look like standard issue white rice, because it's purple-ey black. In Korean food stores, this is called black rice. 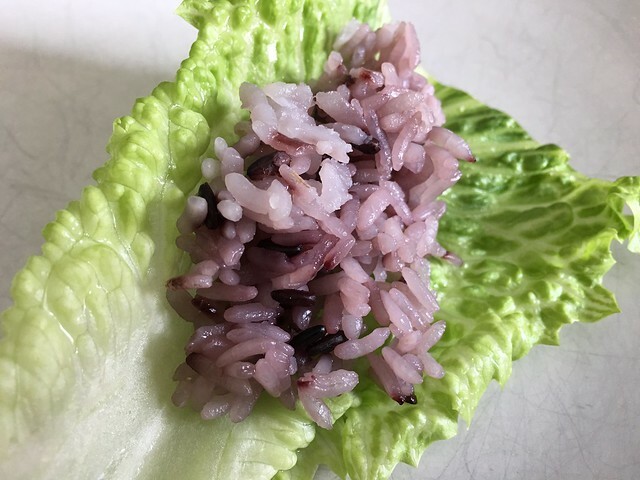 Dr. Kim adds one tablespoon per two cups of white Calrose rice, and the result is that purple hue. This is simple and delicious! We just made this recipe for the first time and it is very good! It's a meal within itself. Is the MSG in the dehn jahng and are all of the other ingredients good for general health? We got the pastes from the Amazon link above. Thank-you, Dr. Kim! There are some people who are quite sensitive to any amount of MSG and are best to avoid it. The small amount included in dehn jahng and goh choo jahng are less problematic, in my experience. I'm not sure if fermentation has anything to do with this. My feeling is that if you can enjoy these foods without any discomfort, you should be fine eating them in moderation. They are staples in my diet - I probably have about a tablespoon of each per week. It looks and sounds delicious and it's packed with essential nutrition for the body, too. I have to give it a try and see how the miso works with the rice and leafy vegetable. Thank you for sharing this article. I have a 3kg tub of doenjang paste and gochujang paste in my refrigerator that I frequently use for Korean and non-Korean dishes alike. In fact, I used gochujang paste yesterday to make a glaze for my pan fried tofu to add to my quinoa, kale and tofu bowl. I often use the same glaze to make Korean tofu tacos. I like adding doenjang paste to my raw nut and seed cheeses for its, dare I state, "funkiness" and I make doenjang jjigae about 3 times a week for breakfast, changing the vegetables as desired. I learned to make ssamjang from maangchi.com, which is a little chunkier due to the addition of green onion, onion and sesame seeds. I will definitely make these lettuce wraps for a fast, easy and delicious snack or lunch. Thanks again. 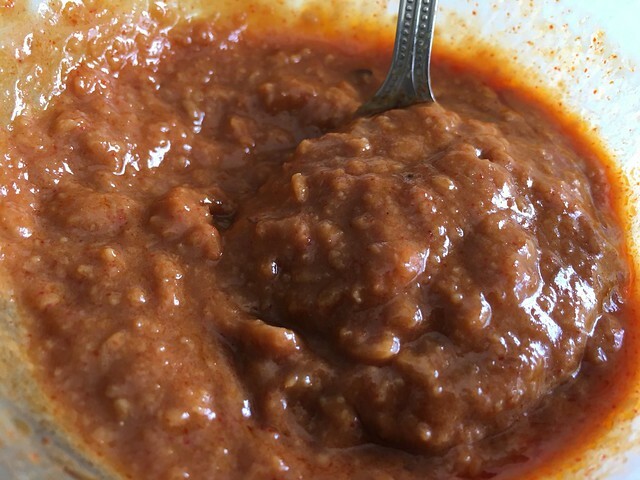 "Wholly Doenjang is handmade by jang artisan Uk Kang from three simple ingredients: soybeans, water and salt, with no chemical additives or preservatives. *The product contains an oxygen absorbing packet on top. It is not for consumption even though it is non-toxic. Wholly Doenjang has a rich, complex taste comes from the care and hard work of a three-year aging process. It is naturally fermented using a traditional, all-natural fermentation method, and it is unpasteurized to preserve beneficial bacteria. ABOUT ARTISAN UK KANG AND THE ART OF JANG-MAKING: Artisan Uk Kang has dedicated the past 18 years of his life to the art of fermentation. Uk Kang currently lives in the U.S. pursuing his passion to cultivate global appreciation for artisanal Korean jang and authentic Korean cuisine. He notes that the reason why manufacturers shy away from the traditional jang making method is that it requires much more attention, effort and fermentation time. Traditional jang is fermented with many strands of natural bacteria, whereas factory-made jang is fermented with artificially cultivated bacteria for faster production and easier quality control. So, factory-made jang may have a consistent taste, but it does not embody the deep complex flavors of the traditional jang. Traditional jang, however, must be made in a clean environment and with consistent monitoring to ensure good quality and taste. Experienced jang artisans like Uk Kang are able to distinguish beneficial bacteria from unwanted microorganisms, which cause unpleasant flavors and smell. They know how to take care of jang even with changes in climate and surroundings. A genuine love and passion for jang, along with years of hard work and patience, are necessary to achieve the kind of artisan expertise which created Wholly Jang." Hi, again. One or two last questions on this, as I'm heading out to H Mart--does this recipe use toasted sesame oil or regular sesame oil? And do the lettuce leaves need to be soaked or anything to make them flexible enough? Or should I just try to fill up the leaf and not really try to roll it? Hello - We used "pure sesame oil" made by Kadoya - you will find it at H-Mart. But I imagine any type of sesame oil will work well. You can enjoy all sorts of lettuce leaves. 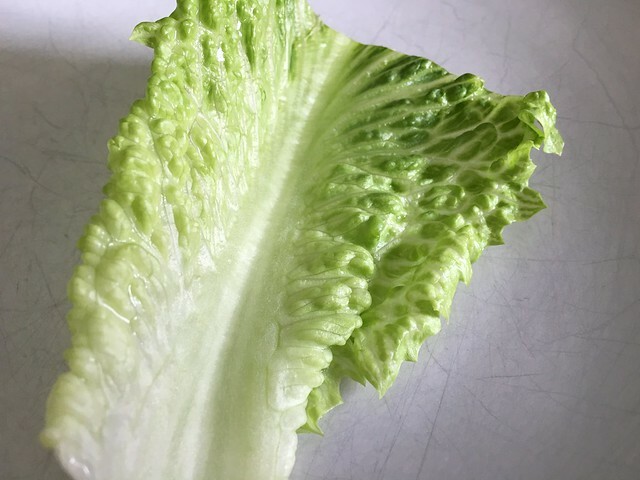 With romaine, the top leafy parts are easily wrapped up, while the crisp bottoms can be used more like crispy taco shells. Red and green leaf lettuce can easily be wrapped up, given their softer texture. I hope you enjoy! I went out and bought the ingredients at a local small Korean grocery and made the recipe and really enjoyed it. It's simplicity itself. I quadrupled the amounts though, to make enough for two people. I also upped the amount of goh choo jahng to add a little more heat. Never worked with black rice before. A little goes a long way, as far as color goes. I always enjoy your recipes. But this time I am disappointed: It sounds delicious, but the link you post for "fermented hot chili paste - available here: goh choo jahng" contains as first ingredient corn syrup. How disappointing! I can't eat the hot chili paste I'm allergic to the chili and other hot spices.Is there a way to add some nice flavor without the hot spice?